Suzanne Marshall and Caroline Parkinson. THERE was a notable first for the club when Suzanne Marshall and Caroline Parkinson joined their partners as full members. 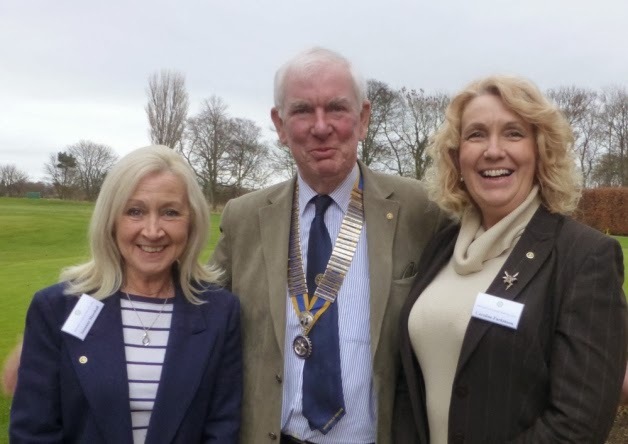 The Ponteland club, which celebrates its 50th birthday this year, has never previously admitted ladies, although worldwide there have been plenty of clubs with a mixed membership. Suzanne and Caroline both felt that they were supporting the club’s activities anyway through their men folk and perhaps they should join up and enjoy some of the benefits. Caroline said: “The community involvement is important as well, both belonging to it and contributing to it through our own skills and time. “In addition, we want to help with fund-raising”. Suzanne, as well as agreeing with Caroline, pointed out the very good social programme they had in Rotary and hoped that more ladies would be emboldened to come forward to join. They would be very welcome. In December, Ponteland Rotary Club sponsored the annual Carol Concert. Earlier in the year there was the Gala Concert at the Britannia Hotel next to Newcastle Airport and before that the Duck Races in Ponteland Park. These are annual occasions and part of the many events in the social calendar organised by club members. This year’s special events to mark the anniversary include golf competitions and dinners for St George’s Day on Tuesday, April 22, and the AM/PM day on Tuesday, May 13.